Fernando Colunga Olivares (pronounced [feɾˈnando koˈluŋɡa oliˈβaɾes]; born March 3, 1966 in Mexico City) is a Mexican actor known for his work in Mexican telenovelas. 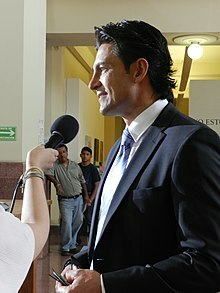 Colunga received his drama education at CEA (Centro de Educación Artística de Televisa). Film and television actor, the only son of the engineer Fernando Colunga and Margarita Olivares began studying civil engineering, had a hardware store, was an auto dealer, worked as a clerk and also as a bartender. "I always had the urge to be an actor, but I did not directly Televisa", began film acting until in 1988 he worked twice as Eduardo Yañez's stuntman in the soap opera Dulce Desafío (Sweet Challenge). From there he decided to go into acting and enrolled in the Centro de Educación en las Artes (CEA) in Televisa in 1990. At the outset, his face became popular in many homes thanks to having a role in the Mexican version of the famous children's program Sesame Street. He appeared in other shows like "The web", "Marked time" and "All of it." He had appearances in telenovelas like Cenizas y Diamantes, Madres Egoístas and Maria Mercedes. Carla Estrada offered him a role in the soap operas Más Allá del Puente with Maria Sorté in 1993-1994. "Fernando is a very studious person and given as a professional, demanding of himself" says Carla Estrada (People Magazine). After this telenovela, had a role in Marimar in 1994 giving birth to Adrian Rosales. By that year, Fernando was released in the cinema with the film Kiss me on the mouth with Paulina Rubio and in 1995 plays the character of Lieutenant Raul Gutierrez Alondra a period novel produced by Carla Estrada, and teaming with actress Veronica Merchant and sharing credits with actors like Gonzalo Vega, Ernesto Laguardia, Marga Lopez, Ana Colchero, Juan Manuel Bernal, Beatriz Sheridan, Eric del Castillo, among others. In 1995-1996 Fernando got his first starring role opposite Thalía in the telenovela Maria la del Barrio giving life to Luis Fernando de la Vega. With this telenovela, Fernando began to be known in many countries. After spending several months touring with his work, in 2005, Fernando returns to television with the telenovela of Carla Estrada, Alborada, a story of time set in Mexico in the eighteenth century. The couple in this case Fernando Lucero, sharing the stage with actors like Valentino Lanús, Daniela Romo, Mariana Garza, Luis Roberto Guzmán, Vanessa Guzman, Arturo Peniche, Iran Castillo and a long list of actors. This gave him the Best Actor award. In 2007 returns to star in a telenovela time, Passion, which is also produced by Carla Estrada. This time he shares scenes with Susana González, Sebastián Rulli and Daniela Castro. In 2008 he worked on the telenovela Manana Es Para Siempre sharing credits with Silvia Navarro and Lucero starring as the villain of the story. This telenovela is produced by Nicardo Diaz, in which he plays Eduardo Juarez, a man who, for his revenge against Barbara Greco (Lucero) changes its name to Franco Santoro. In 2010 he was the star of the telenovela Soy Tu Dueña produced by Nicandro Diaz and where he shares credit with Lucero, Gabriela Spanic and the first actress Jacqueline Andere. In 2012, Juan Osorio would summon him to star in Porque el Amor Manda with Blanca Soto and Erick Elias and Claudia Alvarez as antagonists, debuting in the genre of telenovela a comic touch. Porque el Amor Manda is a Mexican telenovela produced by Juan Osorio, the company licensed Colombian Snail, adaptation than it was in 2011 Secretary. This starring Fernando Colunga and Blanca Soto, with the shares of Erick Elias and Claudia Alvarez who play the main antagonists of the story. It also has antagonist costars María Elisa Camargo and Alejandro Avila, with stellar performances by Ninel Conde, Jorge Aravena and the first actress Carmen Salinas. In 2015 he worked on the telenovela Pasión y Poder sharing credits with Jorge Salinas and Susana González. Unknown role Episode: "Te olvidaré"
José Episode: "Una de lobos"
Ricardo de Salamanca y Almonte/"El Antillano"
^ "La guerrera vengadora - Instituto Mexicano de Cinematografía". imcine.gob.mx (in Spanish). Retrieved 6 January 2017. This page was last edited on 16 April 2019, at 21:19 (UTC).